15 years ago, while talking to a State Senator about the Latino community and the reasons why we do not vote, he asked, “How many Latinos live in Alaska?”, “Do you know how many are registered to vote? Better yet, how many participate in our elections?” I didn’t know what answer. During the same conversation, he told me that it is important to be united, to create a presence, and above all it is imperative to be engaged in the electoral process to achieve the change we want to see in our community. I realized that politicians fully understand who has the potential to elect them, and to whom they are accountable for their actions. Today, better than ever, I understand that to be united means to be able to count on the support of our community not only for ourselves, but also for those less fortunate. United we are strong! By uniting we establish a presence, and having a presence ensures that our numbers will be considered when politicians make important decisions. Being united and having a presence can result in changes that benefit the Latino community, and that is what is most valuable. But we cannot expect these changes without being part of the electoral process. This means that we must vote to make our voices heard and that those who are responsible for unjust acts realize that with our vote, we decide if they will continue representing us. Many Latinos believe that it makes no difference if we vote. They may think that there is fraud in the electoral process as they have seen it in other countries, and perhaps think that it is not worth making the effort. This is not true and to not vote means to give permission to others to decide for us. In the end, politicians understand that they are accountable to those who vote them in, and if we do not vote, no one will take us into account. The 2018 election cycle is very important and the only way to change the policies that negatively impact us. We had primaries on August 21 in which we chose who will represent our party. The winners of the primaries will become candidates in the general election on November 6. We will have the opportunity to elect candidates for Governor, Congressman, state senators, and decide to retain judges. According to the State of Alaska Department of Labor, there are 50,800 Latinos that live in Alaska, of which 33,000 are over the voting age. 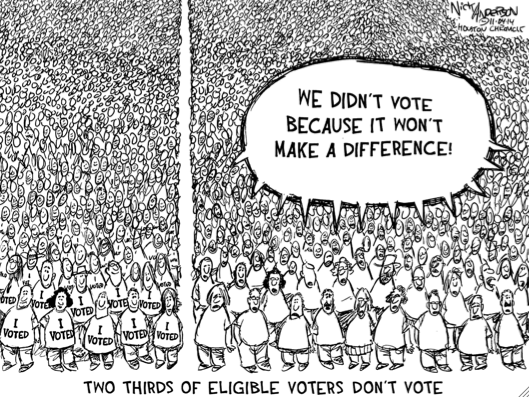 Although all of us are not eligible to vote, but if all of us that can vote get out and vote, we can make a difference. Our vote counts, and together we are strong. Let’s be in control of our own destiny, let’s get out and vote to send a clear message to our representatives: the Latino voice is a loud voice.